As I write, it is lightly snowing with five inches already down and the trees dressed in their holiday finest. In addition to shoveling and plowing, it looks like we'll be cleaning off the travel trailer for the second time within a few weeks. But a White Christmas is always on our daughter’s Christmas list and this year she certainly won’t be disappointed. I’m thinking about my Mom this morning who passed three days before Christmas a number of years ago. 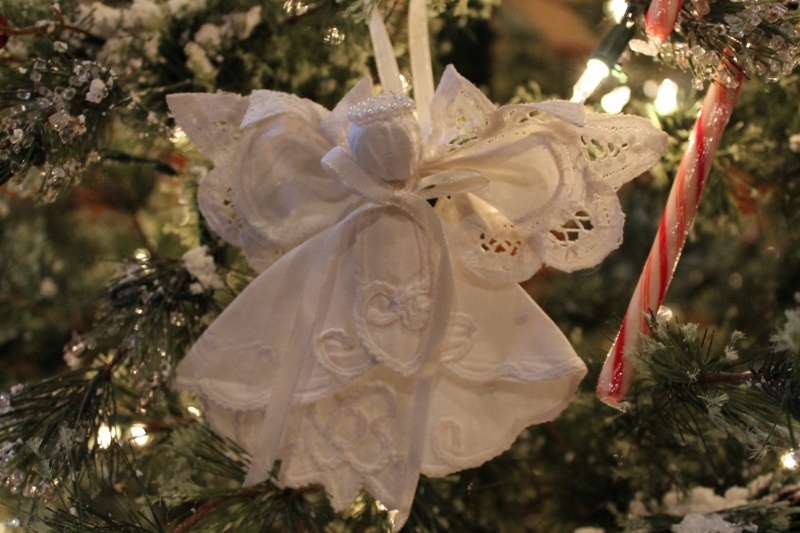 Her name is Angeline and an angel will always top our Christmas tree in her memory. While Christmas is the most important holiday of the year to me due to the real reason for the season, it was my Mom who made it the most magical of holidays. She would haul out box after box of holiday decorations (including red and green tablecloths and runners that she had sewn herself), bake dozens and dozens of Christmas cookies (with my “help”, of course!) and cook not only a mid-day Christmas dinner for our immediate family (poor Dad got stuck at home basting the turkey while we celebrated Christmas Mass at St. Joseph’s), but also create a spread worthy of any restaurant in town for her large, extended Italian family to be served Christmas night. (I am very fortunate in that I have dozens of cousins!) My Mom put her heart and soul into anything family-related because family was always the most important priority in her life. I can only remember a few Christmas gifts from my childhood, but I can remember so many things my Mom did to make the holidays extraordinary ones for my brother and me and then, later, for his kids and mine. I truly hope that all of you are blessed with one or more angels in your life. If you are, be sure to thank them for the kindnesses they’ve bestowed upon you and the warm love they’ve brought to your life. During this holy season, may you all enjoy happy, magical moments with your friends and family members as well as quiet and peace-filled moments in which to reflect, with gratitude, upon the blessings in your life. Merry Christmas! Comments are encouraged and appreciated, so please do join the conversation! Hi, I'm Mary. Welcome to our campfire! Please do pull up a camp chair and make yourself comfortable. I am absolutely passionate about camping and I'll bet you are, too. I love the great outdoors whether I'm walking, biking, hiking or paddling through it - or even just enjoying a campfire with a good cup of coffee in hand. I like to talk about, well, actually, a lot of stuff - our State and National Parks (because they are just amazing and some of my most favorite places on earth! ), outdoor activities (they feed my soul), family, friends and traditions (aren't they what make camping so special? ), ideas to make our camping lifestyle even more enjoyable (who doesn't like a good tip?!) and anything else that comes to mind. If you're like minded, then I hope you'll stay a while and visit. Be sure to come back often - you never know what we'll be talking about! And if you'd like to contact me, feel free to do so via email at reflectionsaroundthecampfire[at]gmail[dot]com. Thanks for stopping by! Check out my favorite places! The Butler County Donut Trail - Bucket List Item! Follow by Email and all new blog posts will be delivered directly to your Inbox!